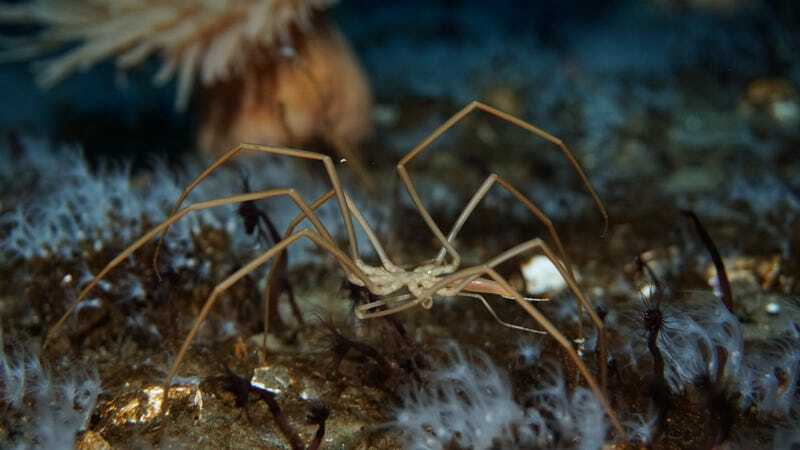 Earth’s oceans are well-stocked with otherworldly inhabitants, but few of these critters are quite as strange as sea spiders, which look like something that would lurk in the crawlspace under Slender Man’s house. With their impossibly spindly legs, sea spiders—which aren’t even actual spiders—stride across the ocean floor with eerily slow, deliberate steps. They eat by piercing stationary animals like sea anemones and sponges with their long proboscises, and sucking up chunks of tissue softened by digestive juices. Now, new research published in the journal Current Biology piles onto the weirdness, demonstrating that sea spiders move blood and oxygen around their bodies not by pumping their hearts, but by pumping their guts. Sea spider digestive tracts weren’t exactly normal to begin with. There is precious little space in their tiny abdomens for organs, so sea spider guts branch out and feed down into the entire length of the animals’ legs. “In effect, sea spiders’ guts are ‘space-filling’ and ubiquitous in their bodies in the same way that our circulatory systems are space-filling and ubiquitous,” said lead author H. Arthur Woods of the University of Montana, Missoula in a press release. This space-filling gut is responsible for a method of transporting oxygen-rich hemolymph—the equivalent of blood in arthropods like sea spiders—that’s totally new to science. The research team, made up of scientists from Montana, Hawai`i, and Australia, determined that sea spiders use strong, rippling contractions of their guts to slosh hemolymph (which exists in an open pool, not in blood vessels) back and forth throughout their gangly frames. The sea spider heart beats weakly, and is only able to push blood throughout the central body, so this gut pump picks up the slack. This pump complements a sea spider respiratory system which, unsurprisingly, is also incredibly unusual, and helps address some unanswered questions about how these animals manage to exist at all. Sea spiders don’t have gills, and instead take in oxygen passively from the surrounding water via diffusion through their porous exoskeletons. The majority of the more than 1,000 species of sea spider are itsy bitsy, often smaller than your pinky nail. But some species in the bone-rattling waters off Antarctica can get as large as dinner plates. All that extra body volume presents issues for the achingly slow process of diffusion, which inspired Woods and his colleagues to explore how these lanky Antarctic titans manage to get enough oxygen. After a recent expedition to Antarctica’s McMurdo research station to study this case of “polar gigantism,” the research team gained an insight into how sea spiders may pull it off. In twelve species of sea spiders collected from Antarctica and temperate locations in Oregon and Washington, the researchers tracked the flow of hemolymph and dissolved oxygen using tracers and video microscopy, and manipulated the wave-like contractions of the gut. They discovered that as a pulse in the gut tube pushes a bulge of fluid and food particles down the leg, a complementary bulge of hemolymph in the constricted space of the leg is squeezed back up towards the body. This pumping action also appears to send hemolymph with high-concentrations of oxygen at the tips of legs upwards to supply the rest of the body. Basically, the legs function like gills, absorbing oxygen from the water, and the gut works like a heart, distributing oxygen to where it’s needed. The discovery of the sea spider gut pump provides an example of an evolutionary innovation that may be more widespread in other kinds of arthropods, overlooked until now. It is unclear if the strange, branched gut of sea spiders evolved specifically for pumping blood and transporting gases, or if this role was taken on as a side job long many millions of years later. Either way, sea spiders have proven that no matter how odd and alien they already appear, they can always have more bizarre surprises hidden up those ridiculously long sleeves.